Indofood has been known as one of the biggest food manufacturer on Indonesia, and has been selling many quality products. 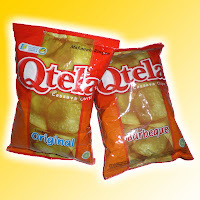 Qtela is one of its product which offering a packed cassava chips, with a wide option to choose for your favorite flavor. Qtela is a chips made from cassava and well processed by modern manufacturer, keeping the quality intact. With a slim shape, crispy and very good taste that reflected a traditional Indonesian snack. Everyone whose have tore the Qtela package will be fixated by its aroma.